Chyeeeaa! This league is a 12 man, H2H. Run by the cats over at Give me the rock. I was picking 9th and took Wade over other staples like Kobe and Daniel Granger. I feel good about it, but not too good. I had mentally decided to take Rondo or Nash on the way back, but Rondo was gone by my pick 16. Nash was there, but my man-crush for fantasy defense sneaked up on me and I pretty much accepted that %s would not be a major factor in the rest of the draft. Nani is a personal target of mine this year and I was also happy to get Rudy Gay on the way back. His low efficiency and lack of rebounds fit on this team nicely. After round 4, I decided to tackle all the "fun" categories: points, assists, steals, blocks, 3's while mostly ditchin' rebounds, %'s and To's. I went guard-heavy with Arenas and Harris in the next 2 rounds, players who have both been top 25 picks at one point in theys careers. I found Terry at 81 was too good to turn down, even though I was already loaded with guards. I needed a center on the way back and vested in Okafor, hoping that Nani, JSmoove and Mek would be enough to keep me honest in blocks week ta week. Right after Emeka, center eligibles Hickson, McGee, Haywood, Brand and Cousins all went off the board within ten picks, so it felt good to get a little stability in the post. I can't imagine why I took another point guard in Jameer Nelson, but Maggette was another high scoring, low effieciency player to go along with the theme. 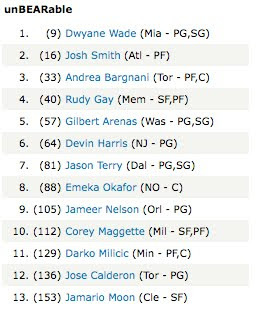 Darko was a pick I regret, but needed a reserve C and Calderon could prove to be a valuable at 136. Yahoo seemed to think Jamario Moon was top 50 material when he averaged almost 3 combined steals/blocks/3s and no To's 3 years ago. I am thinking of dropping him and picking up some clean towels. This team looks solid and should have no problem scoring. If potential injuries Wade, Arenas and Harris all play near the ceiling of their games, I should have no problem ruling with a bloody, iron fist, showering my opponents with jeers and stink eyes. If Wade goes down, the team collapses, I shave my head and punch-kick the next person that asks for my autograph. Next Week: We abandon the mock draft and start mocking the daft!